While it’s all too easy to get caught up in the excitement of booking and arranging a whole host of amazing things to do for your stag weekend, be sure you don’t overlook one of the most important aspects of the weekend; some accommodation! Most of us will happily sleep in a gutter for the weekend, but that’s just not the stag do style anymore, especially when you realise that decent accommodation doesn’t need to cost you an arm and a leg. You'll find hostels to be suitable for most stag parties, because as men we're not entirely fussed where we sleep and we're especially not fussed where we sleep when we're away with the lads. As you would expect, hostels are almost always the cheapest option that we can offer you in terms of accommodation for your stag weekend. The best time to book a hostel would be if you have enough members in your stag party group to fill one or two (or even more) rooms completely. Then you've got yourselves a great social base for your weekend, with no need to worry about getting ready in different rooms or where everyone else is. No matter what your budget for the weekend may be, you’ll always be able to sleep with a roof over your head. From hostels to apartments, you’ll find something suitable for the lads no matter where you are taking the stag for a weekend to remember. 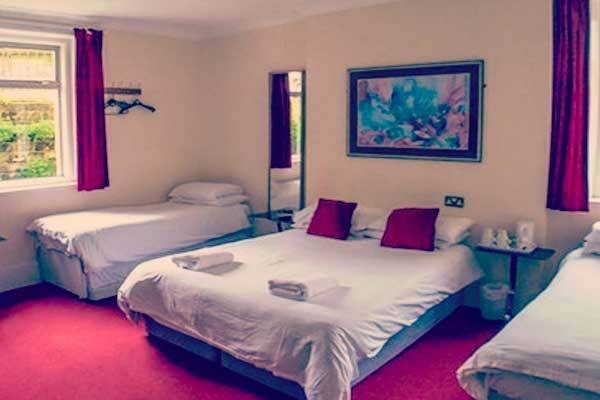 You'll find that we offer hotel accommodation in every one of the towns and cities that you can book your stag weekend with us, and hotels are our most popular accommodation type. Most locations will offer two, three, and four star hotels for you to choose for your weekend package, and our working relationships with these hotels allow us to get preferential rates for you and your friends. We do offer five star accommodation in select cities (London, for example), so the stag groups that want to spend a weekend as kings can do so easily. 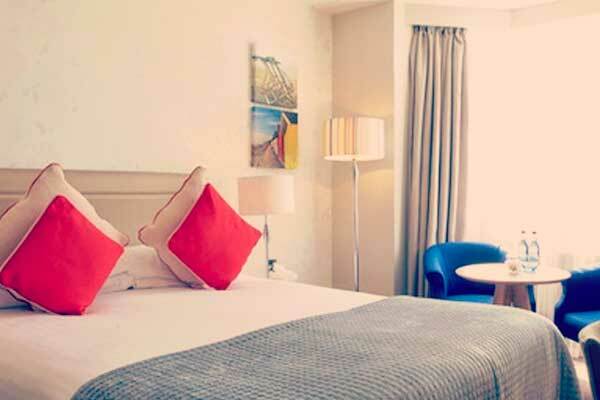 Room types and set ups vary from hotel to hotel, but for the most part you'll be able to get double and twin rooms. Certain hotels in select locations may also offer triple and quad room types, allowing up to four adults to sleep in one room. This is dependent on location, hotel, and availability, and your party planner will be able to advise on what we can and cannot offer for your group in your chosen location on your chosen weekend. Hotels can fill up quickly, especially around key dates such as Bank Holidays, school holidays, and events such as football matches. So the sooner you book your stag weekend the better, as you'll be guaranteed your accommodation and you may even save a bit of money by avoiding a last minute rush to book anywhere you can find. We also offer apartments in select cities, with the ability to sleep up to eight people in some. As a general rule of thumb the maximum number an apartment can sleep is six, again this is down to location and availability. Apartments are a great way to socialise during the weekend, especially when you compare the space you'll get in relation to say, a double hotel room. The social aspect allows the group to get to know each other, and most apartments will include a kitchen which allows everyone to prepare their own food and to store food and drink for the weekend too. 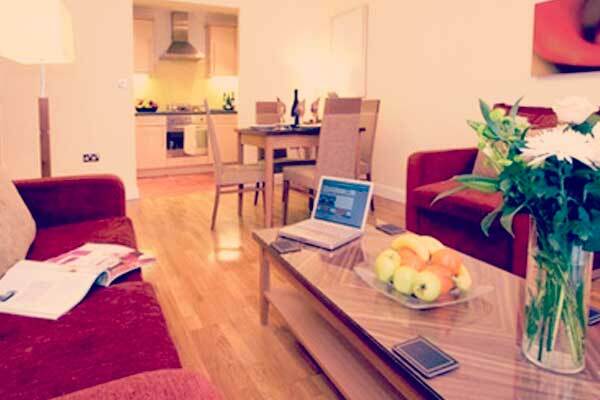 If you've got a large group then apartments could be your best choice for the weekend. If you have any questions or queries about your weekend and your accommodation you can enquire with us, or if you've already enquired you can call your party planner on 01273 225 070, will be more than happy to run through the options available to you in the location or locations you're planning on taking the stag to. As we don’t currently offer flights as part of our stag weekend packages you’ll need to find and book them yourself. However, don’t despair because we’ve got all the information you need to know right here on this very page! You’ll find information on which airlines fly from which of the main UK airports, as well as some hints and tips on how to get your flights booked as cheaply as humanly possible. There are also plenty of tips on how to pack for your trip (be smart and you can fit everything you need for a weekend in a carry on backpack, or even months as this guy proves), additional fees that you may encounter from the airlines, and much more. So you’ve decided to take the stag do overseas, and now you need to find out how to get to your destination. The first step is finding out where you can fly from in the UK in order to get there, which you can do by using Which Budget, a free flight search engine and destination finder. Here you can find which airlines fly from which locations to your destination of choice. For example, if you’re booking a stag do to Tallinn then a quick search on the Which Budget site to find where you can fly here from. You can fly from Glasgow to Tallinn with EasyJet but the flights are indirect, so you might want to think about flying from somewhere else. London Gatwick offers direct flights to Tallinn, so if you’re in the south you would look at booking your flights here and flying out of Gatwick. Sometimes the limitations of your local or closest airport can affect your choices and decisions for your stag weekend, so be sure to check where you can fly to and from first. If you aren’t already aware, Skyscanner is a very useful website where you can input your dates and where you wish to fly to, and it will scour the various airlines booking engines and websites to find the cheapest possible options for your stag do with the lads. However it isn’t the best site to get an accurate idea of prices, and in this instance it is best to do the work manually to ensure the prices you see are as up to date as possible. There are a number of factors that can affect seat prices on flights, and as a general rule of thumb the earlier you book seats the cheaper it should be. You should also be aware of any additional fees that are added to the seat price by certain airlines, for instance Ryanair may offer seats at £15, but once you factor in costs for hold luggage you may end up paying anything up to £75 each way if you pay at the airport. You should also bear in mind that almost every airline will charge you to pay for your flights by credit card, and EasyJet and Wizz Air charge you to pay even if using a debit card as opposed to a credit card. Be aware that certain airlines will charge you for checking in at the airport. In Ryanair’s case, the charge is £140 per person, per return trip! Monarch don’t charge you to check in at the airport, however the only way to check in online with them is to pay for allocated seating, so be sure to check with both the airline and the airport to make sure that nobody gets stung with any fees before you’ve even checked in. Make sure you don’t forget your boarding pass if you check in online, else you’ll most likely have to pay a fee for a replacement boarding pass. Alternatively, some airlines have their own apps that allow you to download your boarding pass, doing away with the need to print anything. Another way of keeping your costs down is to make sure that everyone only brings carry on bags. The benefits of this are two-fold; you avoid costly fees for stowing your luggage in the hold, and there is no waiting around at baggage reclaim once you're there. Articles like this one from Skyscanner will show you how it is entirely possible to pack for a weekend away into a single, carry on bag. Be very careful not to input any information incorrectly when booking flights online, as airlines will charge you a very high fee to amend even the slightest detail. If you misspell your name by just one character you may need to pay an admin fee on this, with the admin costs fluctuating from one airline to the next. However, if you want to change a passenger name you can be looking at paying up to £160 (if you need to change a passenger name at the airport, with Ryanair). Furthermore, if you have to call to make any changes to your flight details you’ll most likely have to do so by calling a premium rate phone number. Take a look at SayNoTo0870.com, where you can search companies and businesses to find alternative numbers at local rates, to at least take the sting out of your phone bill, if not your overall flight costs. Finally, if you’re going abroad you’ll need to remember to get some foreign currency. You won't get the best exchange rates if you wait until the airport to change your money up. Your best bet is to do it before the trip, or if you can’t do before you get to the airport you can order in advance and pick up on arrival, which often gives a slightly better exchange rate. Use a site like MyTravelMoney to find where you can get the best rates and best deals.